This is really one of my favorite prompts because I love learning about other countries and other cultures through fiction. I typically like to listen to my book choice on audio because then I get to hear the narrators awesome accent! ❧ Tanya … My choice this month is coming from one of the Major Book Award Winners from last year – The Moon in the Palace, Weina Dai Randel. 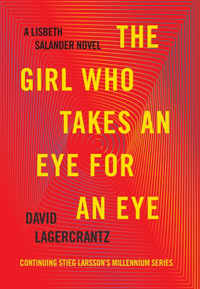 ❧ Kim … My choice this month is The Girl Who Takes An Eye For An Eye, David Lagercrantz. This is the 5th books in the Millenium Series (Girl With The Dragon Tattoo) and I’ve been on hold for it through my library for a couple of months. I always forget to come back to link up each month! I read Fear Nothing by Dean Koontz. I missed the link-up, but I read Jessie Burton’s The Miniaturist, set in the Netherlands. I read Ben Lerner’s Leaving The Atocha Station (set in Spain). I liked it but had some doubts. Oops, I didn’t use the linky for the February read. I will go back anbd see if I can link up. For the March book I am going to read The Dry by Jane Harper, I will “visit” Australia. I just read that book and really liked it! I finished it and liked it quite a bit. Looking forward from more by Jane Harper. The linkup states it’s closed so I will put my March link here in the comment .